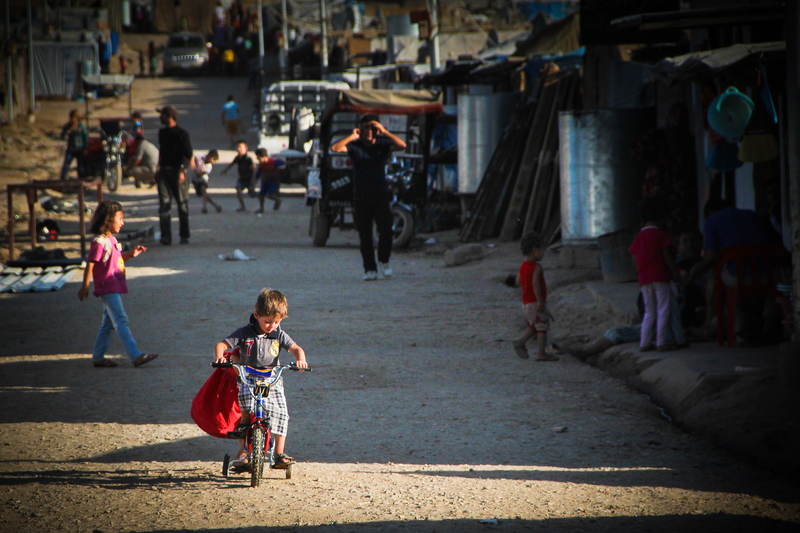 Screen grab: video editing some testimonies from Zaatari camp. This is 70-year-old Ahmad — two sons and one limb later, the fighting became too much and he fled to Jordan with his wife last year. 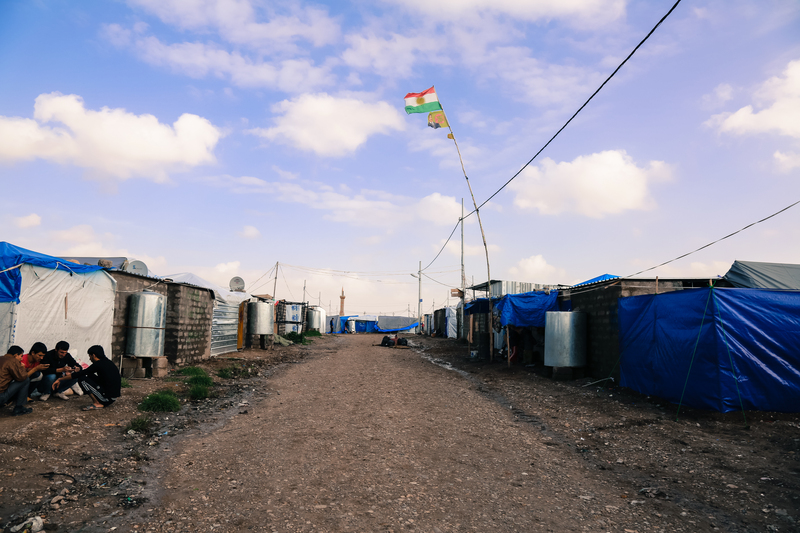 I went back to Domiz refugee camp this week after months away, and I was surprised to see how huge it’s become – it’s now organized into streets and quarters. Oh, the joys of your first fish costume. Domiz refugee camp. 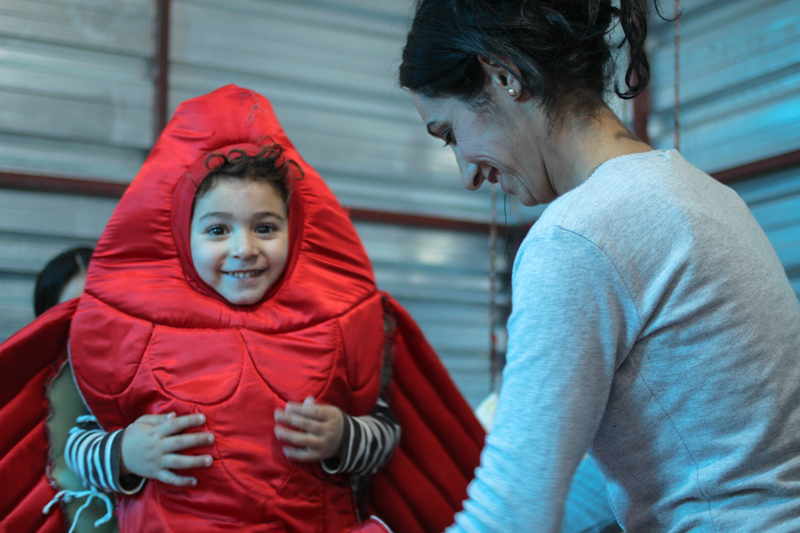 We arrive at the Domiz cultural center in the early morning to set up for the event: an art festival showcasing children and adult refugees’ paintings and drawings. I shuffle my feet along the greyish floor, noting that the hallways and walls are completely barren. Fadi explains to me what is going to happen: we will adorn the walls with kids’ paintings, and set up the adults’ work on easels all along the halls. 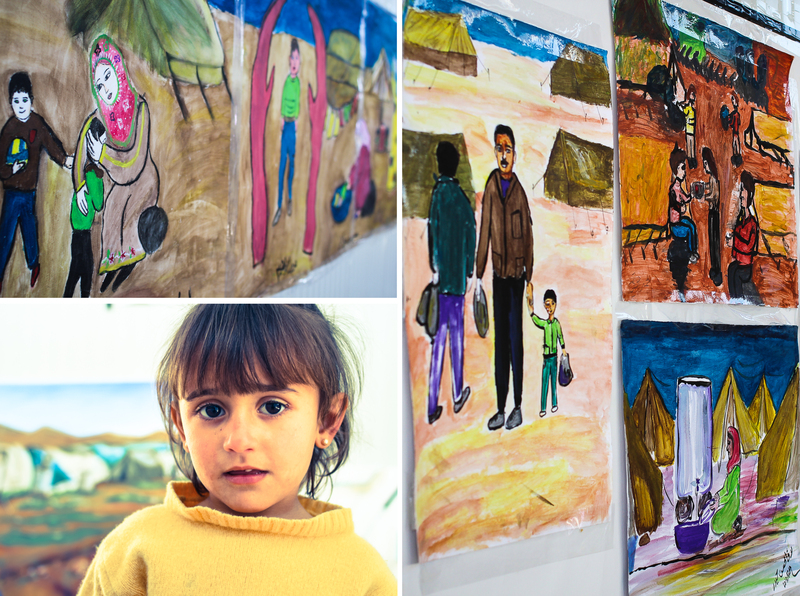 “The adults are all professional artists who live in the camp,” Fadi tells me, taping a colorful drawing to the wall. I blink. I never considered that there would be professional painters living in Domiz. The idea seems, embarrassingly, incongruous to me. I see the camp as a place where people go just to survive. Maybe they sew to make a living, set up a small construction shop, give people haircuts—they don’t make beautiful art. But as the paintings go up one by one, it is so clear that these artists are trained, I mean trained. I notice that every piece is exquisitely, and mournfully, informed by their experiences as refugees. The afternoon passes by swiftly; it feels like magic and also like heartache. I stop by a painting of large purple fish, swirling and transcendent. Fensa, the artist, explains, “They represent children, taken away from their home. They are like fish out of water, it’s almost impossible to survive.” I ask her why she paints. 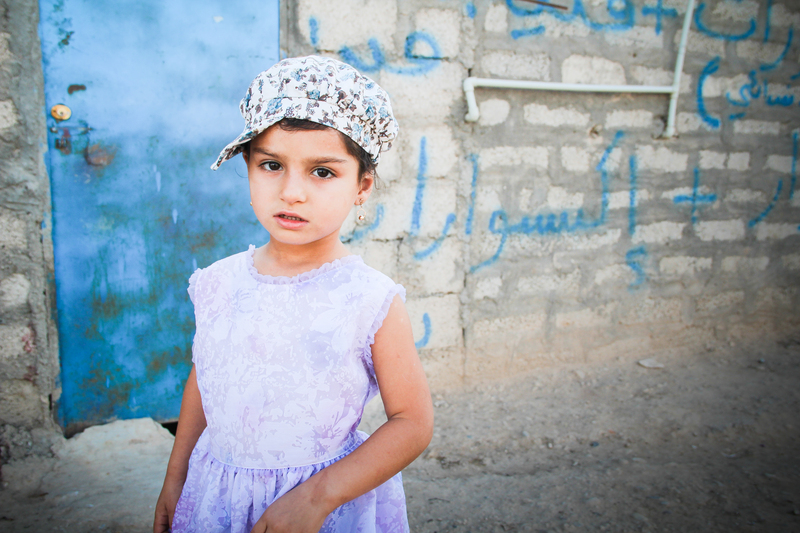 She says, “to escape from the camp.” It is difficult to be an artist in a refugee camp. Just consider. Materials are hard to come by, as are places to show and sell your work. Samir studied art in university in Syria—in a stylish beret and suspenders, he pouts appropriately for the camera. “I usually like more abstract art,” he says. “But I drew this piece so that the message was really clear,” he gestures towards his colossal painting: a woman wearing a hijab, a child slung on her back, one hand covering most of her face. “I drew people afraid when they came from Syria, but then they are happy because they’re safe here.” Rojla, 12. 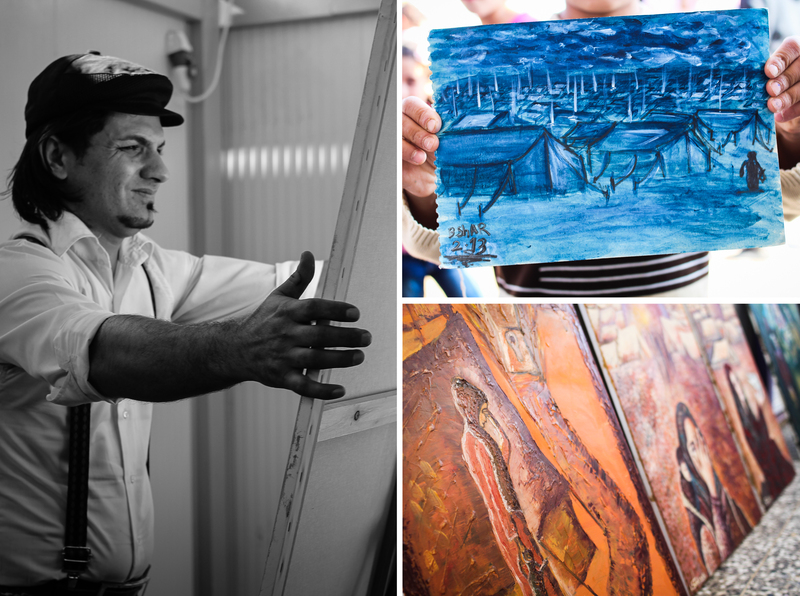 “Painting, for me, helps me run away from the tents. To run away from my situation.” Sipa, 29. “Today, I don’t feel like a refugee.” Fensa, 27. I kneel down to say hello to a little girl with bouncy bangs and a bowl cut—she gives me a huge smile showing small, chipped teeth, grabs my face in her hands and kisses my cheek. It’s like magic and like heartache. I get to talk to people and then they are kind enough to let me take their picture. 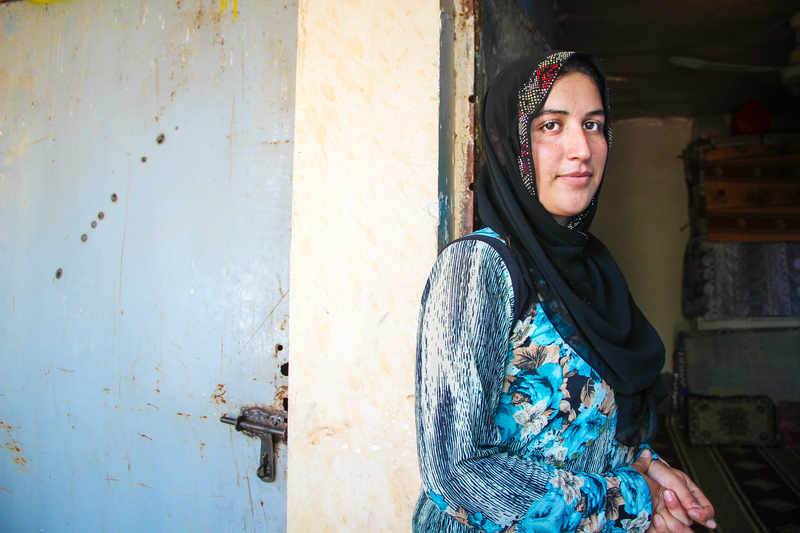 This radiant young woman hopes to start her own business one day in Erbil. The spunky attitude is only enhanced by the sideways hat, no? The triumph of childhood. 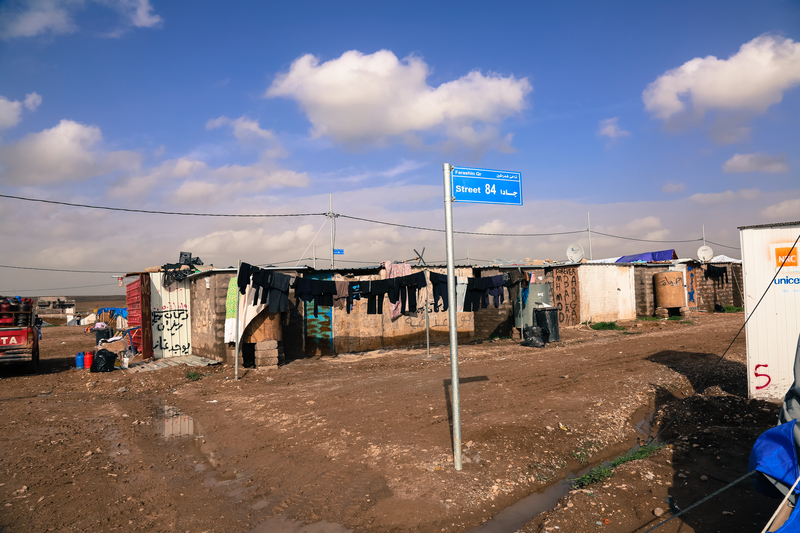 Domiz camp, Iraqi Kurdistan. Just married – three days before crossing the Syria-Iraq border. You know what always gets me? 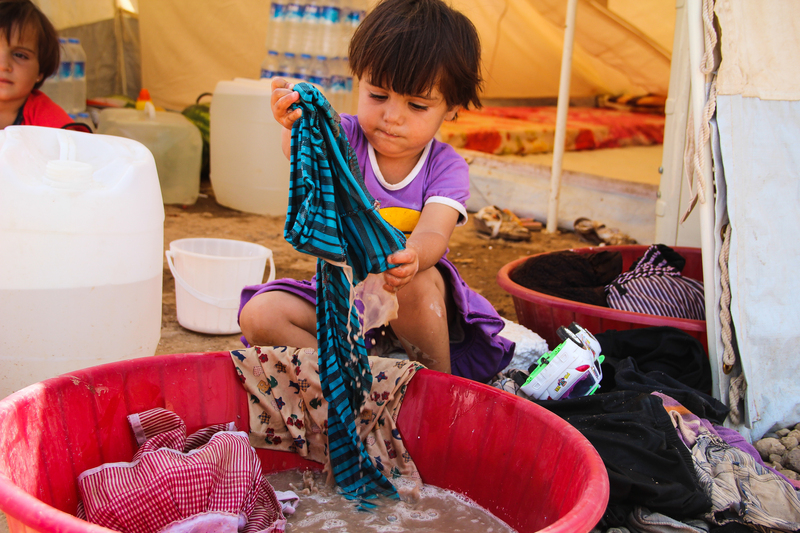 Little kids washing their own clothes.